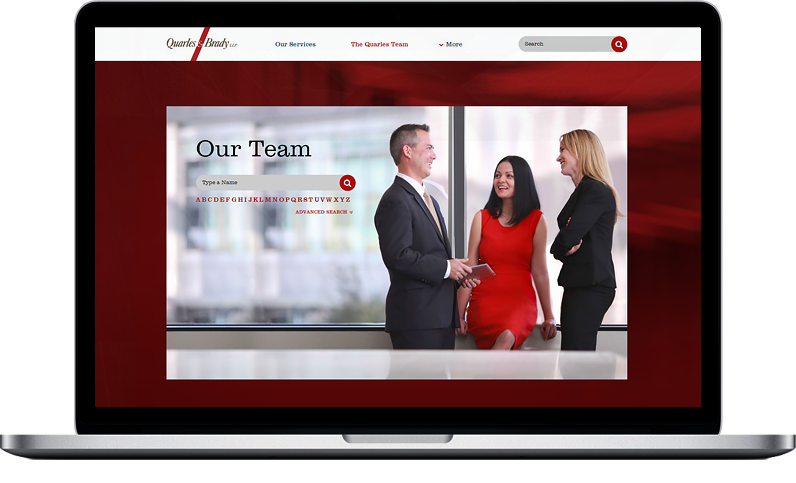 State-of-the-art website launched for Quarles & Brady, an AmLaw 200 law firm with more than 475 attorneys in 9 offices. Quarles & Brady launched a new state-of-the-art website that was designed and developed by Great Jakes. The website, which launched on September 23, was designed to reflect the firm’s progressive nature as well as its top-tier status in its various markets. Client Stories – The homepage features a series of playful images, each of which links to a story about the firm’s relationships with clients like Harley Davidson and Serta. Minimalist Navigation – The website eliminates clutter by having only three visible items in its top navigation. Striking Photography – The website also features a series of engaging photos of its attorneys “in-action.” This photography, with art direction by Great Jakes, was shot onsite in the firm’s nine offices. The website was built using the Great Jakes Rainmaker CMS technology. A key feature of this technology is how it enables the creation of Attorney Microsites – a unique approach to lawyer bios that was pioneered by Great Jakes. Attorney microsites essentially are small websites for each attorney that fit within the firm’s larger website. Information-rich attorney microsites help Quarles & Brady attorneys demonstrate their particular expertise. William “Bill” Hamilton chose to showcase his Twitter activity. Kim Johnson’s bio features a “Beyond the Office” page that tells a little of her family life. Jennifer Rathburn has separate custom pages promoting two aspects of her practice: "Health Care Experience" and "Privacy & Security Experience." The website also includes responsive design mobile technology that automatically adjusts and resizes the pages on the website to fit the screen of any mobile device.